Serving as your representative on the Dallas ISD Board of Trustees over the last 9 months has been a great honor and privilege. I look forward to my own full three-year term representing District 2, which includes parts of Preston Hollow, East Dallas, Lakewood, Bluffview, and Oak Lawn. To continue improving outcomes for kids, it is imperative that we retain a reform-minded majority on the board! Please support me in the June 2017 run-off election so I can continue to represent our kids and families. I have dedicated my time, energy and resources to making a real difference in our public schools. In addition to my service as a Trustee, I have served in leadership roles in several organizations that are making great strides in improving our public schools. My experience in these organizations has served me well as your Trustee. 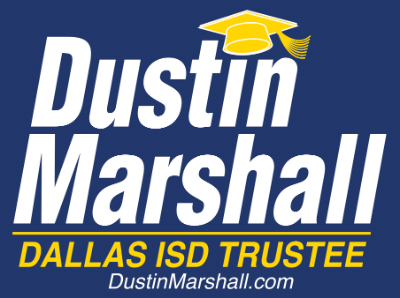 For these reasons and more, I ask you to vote to reelect Dustin Marshall for DISD. I have a long history of leadership and volunteer work in our schools, and I’ve tried to help our kids everywhere I have lived. Before returning to Dallas, I was active in organizations and initiatives in both Boston and Chicago. I did pro-bono consulting work to help launch a “Cristo Rey High School” in Boston – which operates a work/study model where high-schoolers work at an internship during school. I helped the school to market their model to local businesses so that they could have a larger supply of available internships. In Chicago, I worked with other members of the Bain Chicago office to help start Rowe Elementary School. I’ve done 1 on 1 literacy tutoring for kids in multiple DISD schools as a volunteer with Reading Partners. I’ve organized Reading Partners annual fundraiser – the Celebrity Spelling Bee. I led my Leadership Dallas class to choose to build STEM based “Maker Spaces” in 4 different high schools. We raised the funds, designed the space, acquired all the equipment and physically built the space. I worked with the Woodrow Wilson High School Community Foundation to successfully open a new Reading Center at the Mt. Auburn campus. More recently, I’ve started working (through the Woodrow Wilson High School Community Foundation) on several initiatives in the Woodrow pattern – including finding local business people to mentor the principals and working to improve culture and cross school cooperation via joint events and academic competitions. 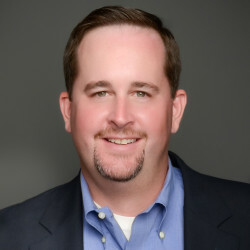 I am also the CEO of Hazel’s Hot Shot, an expedited freight and logistics company headquartered in Dallas, TX. At Hazel’s I lead a team of 200 folks in providing emergency, time critical deliveries to thousands of businesses across the United States. Prior to joining Hazel’s, I was a Manager in the Chicago office of Bain & Company, a leading global consultancy. At Bain, I led consulting teams in their work with Fortune 500 companies. I have a Bachelor of Science (BS) in Economics from the Wharton School at the University of Pennsylvania and a Masters in Business Administration (MBA) from the Kellogg School at Northwestern University. 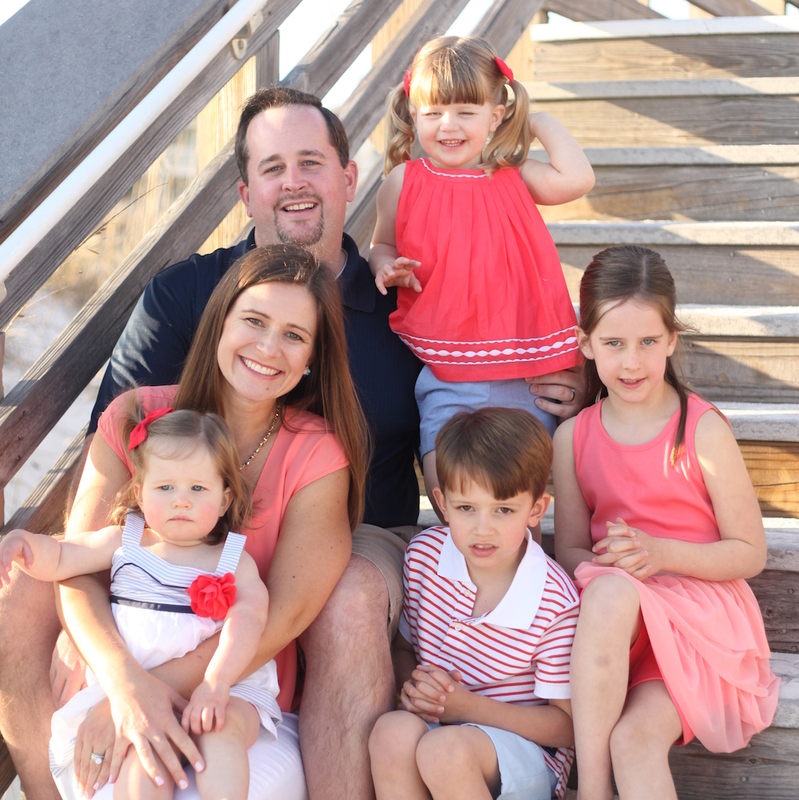 My wife, Denise, and I live in the Preston Hollow neighborhood of Dallas and we have four amazing children, Lilianna, Jackson, Hailey, and Madelyn.